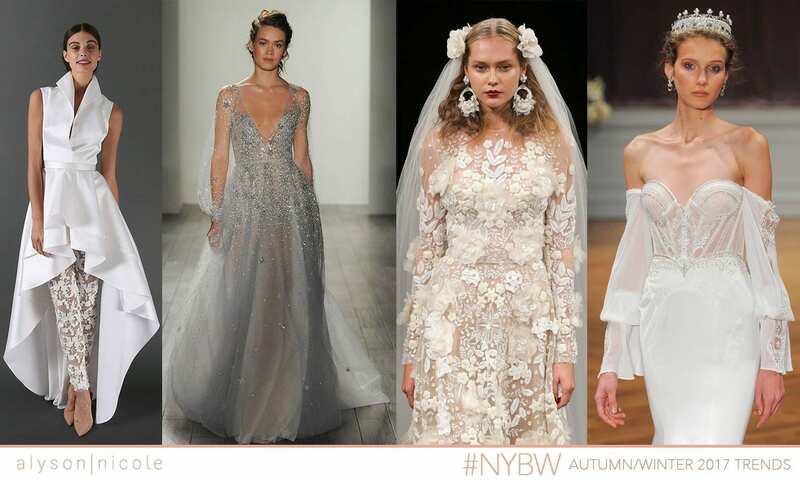 Twice a year, a magical thing happens… New York Bridal Week. ::sigh:: Let me tell you, it truly is filled with gorgeous mouth dropping dresses that will make you wish you could have numerous weddings with unlimited budgets (well that’s how it is for me at least). But most of all, off-the-shoulder sleeves were EVERYWHERE and in every style. 2. Cascading ruffles were another huge trend this season. Now I’m not talking about just the skirt having this detail (as per usual), I’m talking all over and with different materials such as fringe, tulle, lace, and even feathers. 3. Colour was another big trend that was full of blush and blue hues along with deep rich golds. Some designers went all out- head to toe. Then there were a few that introduced colour with beautiful prints. 4. One of the more provocative trends was the boudoir inspired theme that popped up in quite a few collections. A few designers kept these dresses somewhat modest, where others went all out with super sheer fabrics and wispy lingerie-like details. 5. Pant and jumpsuits are continuing to pick up speed among the bridal world. (To be honest, I love it!) Designers showcased a variety of different options which proved a bride in pants is beautifully chic.